Low water levels on the River Spey has been one of the factors that has contributed to “catastrophic” catch numbers. Gloomy estimates suggest it could be one of the worst years on record for the river, which provides a huge annual boost to the economy of the north and north-east. In an effort to arrest the decline, the Spey Fishery Board had outlined an ambitious plan to collect about 350 fish from the river an attempt to double production at its Glenlivet hatchery to one million eggs. However, now the Scottish Government has told the group to keep the total at 200 amid concerns that removing any more could threaten the viability of the entire population and the river’s conservation status. Last night, anglers warned that doing nothing was no longer an option to reverse the decline. Ian Gordon, who has been a ghillie on the Spey for nearly 40 years and now runs trips for international visitors, believes this year’s season may have been the “worst ever”. He said: “There’s no doubt this year has been disastrous. Very often following a season with low, warm water there is an upturn the following year. 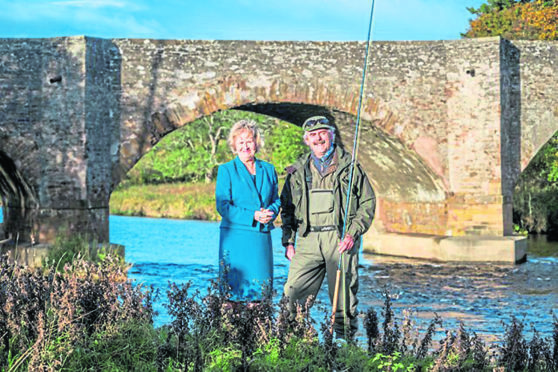 “I would expect that again – but if we don’t get it then it could very well be the death of the Spey. “Hatcheries have been proven to work in Iceland. We’re at the stage now where we need a national case study to see if it would work here, we were actually at that stage a few years ago. Studies done on the River Spey have estimated that angling is worth nearly £12 million to the communities that line its banks. Recent years have had a declining amount of salmon returning to the river – an issue attributed to numerous factors including fish farming, forestry, predators, illegal poaching and physical barriers. A £500,000 project has been commission by the Scottish Government this year to examine the reasons. However, this year’s exceptionally warm and dry summer, which resulted in water levels dropping to levels last seen in 1976, has made the situation worse. Spey Fishery Board chairman Brian Doran explained the organisation remained “fully committed” to its hatchery at Sandbank in Glenlivet despite being told to curb its efforts by the Scottish Government. He added: “It’s been a particularly difficult salmon fishing season, during which the board carefully considered the scientific advice regarding hatcheries against the commercial interests. “The Scottish Government’s licensing authorities, have raised concerns about the low salmon catches this season, which are indicative of a reduced run of fish returning to the river. A Scottish Government spokesman said: “Both Marine Scotland and Scottish Natural Heritage completed habitat regulation assessments in respect of the Spey Board’s application.